We all heard of SSD advantages. They provide faster transfer rates and much shorter access time than typical hard disk drives. The disadvantage is that they are much more expensive. In this article I'll do a quick performance tests of a SSD disk connected to a computer via USB3 and USB2. For my tests I used ADATA Premier SP800 32GB SSD, which I placed in LogiLink UA0115 external case that offers USB3 interface. The SSD was then connected to three USB controllers based on different chipsets. One USB2 (Asus N53S) and two USB3 controllers based on Etron EJ168 chipset found on GA-H61MA-D3V motherboard and Asmedia ASM1042 based controller on PCIe card - Media-Tech MT5085. Adata makes a lot of SSD disks and they are rather positively reviewed. Tested model has a SATA 3 interface - 3 Gb/s which gives 384 megabytes per second. When mounted in the LogiLink case it was ready to work after plugging it into the computer. Etron USB3 chipsets are rather old stuff and seems to have bad opinion on many hardware forums. They were used on some motherboards and they did make problems. In my case the USB3 works with mass storage devices, and doesn't work with other USB3 devices (machine vision camera, card reader, USB3-HDMI adapter). Media-Tech MT5085 PCIe controller with the Asmedia chipset is a cheap branded controller that you can easily get. Just mount it in the PCIe slot, connect power (MOLEX) and you are done. For Windows there are additional drivers. The Asmedia chipset seems popular among such external controllers. Those results show how much improvement USB3 gives. 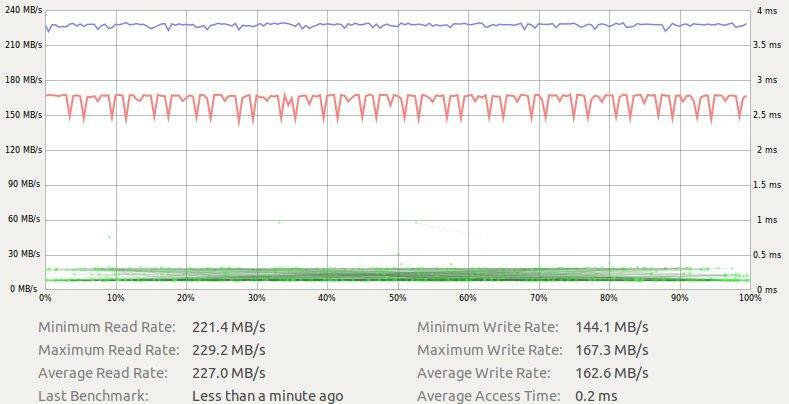 The transfer rates are much higer than in USB2, which handled the USB3 device without problems. 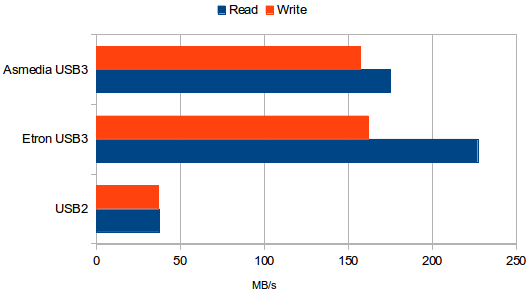 USB3 controllers where fast, but Etron was fastest, especially with the read speed. I've did a second test to compare my laptop Seagate ST9500325AS with the SSD on USB2. 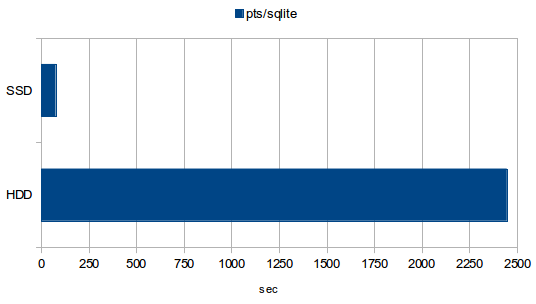 I used the phoronix-test-suite to execute pts/sqlite test which performs a number of INSERTs to a SQLite database. 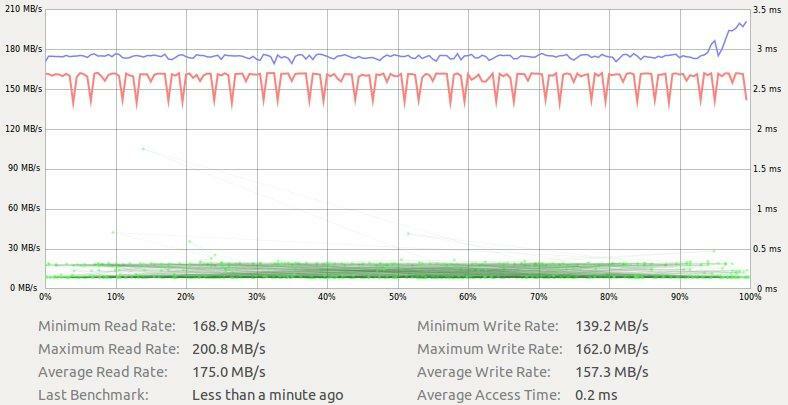 The HDD needed 2447 seconds, while SSD only 76 - that's 32 times faster. In both cases ext4 partition was used.